The Liza Lee Academic Research Center is Hockaday’s state of the art, three-story library, where students can be found at any given hour, working diligently in one of the many nooks of that the vast space has to offer. A student can always count on the fact that they can utilize the library, whether that be to quietly work or to find a book for the infamous JRP. There is certainly someone behind the curtain to which the success of the library can be accredited to; or rather, three women. //PICTURED ABOVE: Upper School librarian Katy Lake shelves books that have been returned from Upper School students. Katy Lake, Corey Lott and Elisa Drogin are three Hockaday Upper School librarians who dedicate their time to ensuring that students have the best possible experience in the library. 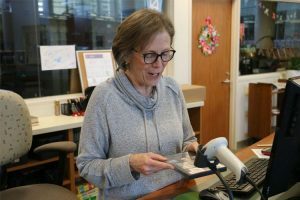 Lott, a Hockaday librarian veteran of sorts, will finish up her fifteenth year as a Hockaday librarian this May. Although starting out her career in the financial industry, it didn’t take Lott long to find her true calling. “At the time, we were living in the Massachusetts, and I was actually volunteering in the Newton Public Library as a way to relieve stress. So, my husband one day said, ‘Why don’t you just go try and see if you can find a job in the library because that seems to be what makes you happy, and we’ll just go from there.’” Lott said. After her employment as a librarian at a handful of libraries, such as those at Boston College, Southern Methodist University Law School and the St. Mark’s School of Texas, she came to Hockaday, where she has been ever since. //PICTURED ABOVE: Upper School librarian Corey Lott searches online for new books to purchase for the library collection. Common tasks that Lott performs include placing large book orders, going through book reviews in search of new finds and helping students search for items. 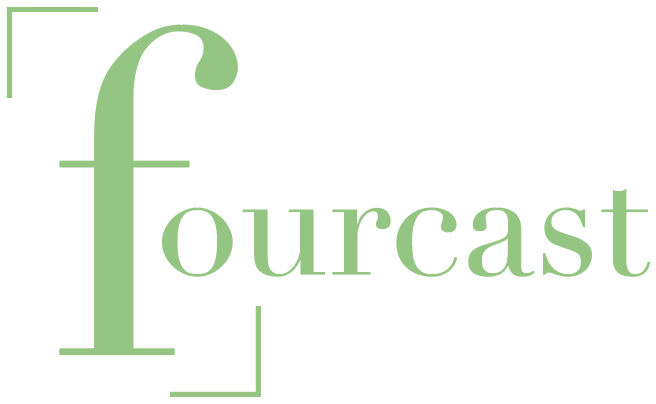 Furthermore, the library staff is currently working on a project to put in all the tables of contents into all the books’ catalogs to make locating resources relatively easier. 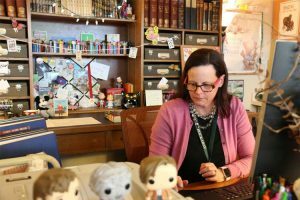 Lake is nearing her seventh year as a Hockaday librarian. She always gravitated towards libraries, and as a result, went to graduate school for Library Science, where she further refined her skills. Prior to coming to Hockaday, she worked in public libraries. Much like Lake, Lott would agree that there is no daily agenda when it comes to her job—she responds to situations as they arise. However, when not working on the tables of contents project, she often shelves books or helps find new picks for the Hockaday collection. Her favorite part of her job, however, is the interactions with the students. //PICTURED ABOVE: Lake organizes books that have been returned by students in preparation for the shelving process. 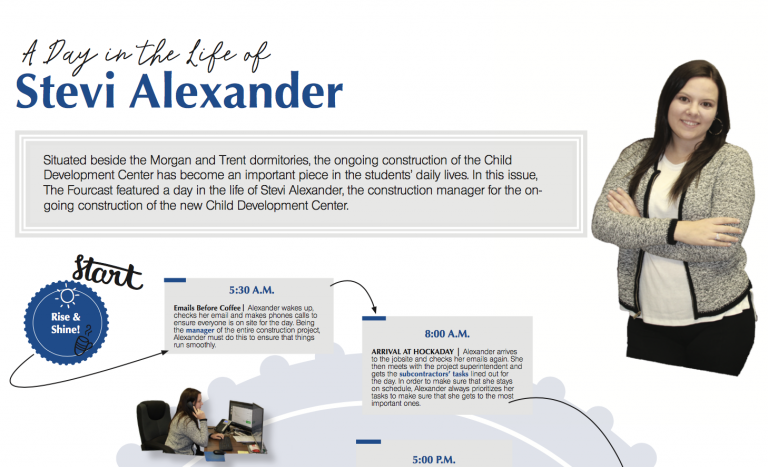 When Lake and Lott leave for the day at 4 p.m., Library Residence Department Librarian Drogin’s job has just begun. 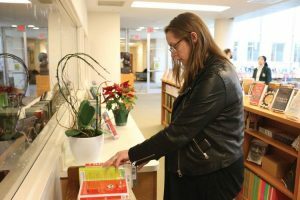 Arriving at 4 p.m. and leaving at 10 p.m. Monday through Thursday, Drogin is the librarian who oversees all library activity during the nights so that students can study there during the evenings, should they choose to. 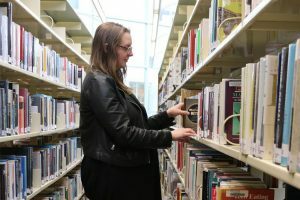 She even comes in on Sundays, 2 p.m. to 9 p.m., to ensure that students have access to the library whenever they need it. This year marks Drogin’s sixth year working in the library, but before starting there, she worked two years as a dorm mom. However, she has not always been a librarian. 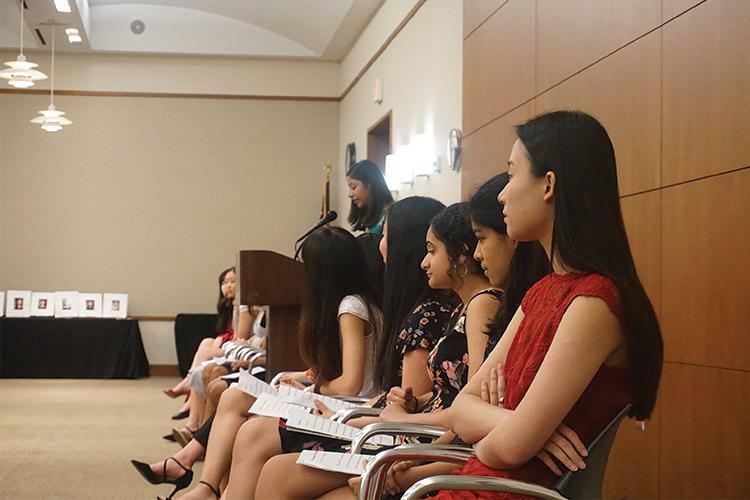 In fact, she has worked at a variety of different jobs, such as an administrative assistant, as a fundraiser for the University of Dallas and at a non-profit organization. //PICTURED ABOVE: Residence Department librarian Elisa Drogin checks out a movie for a student to take home. 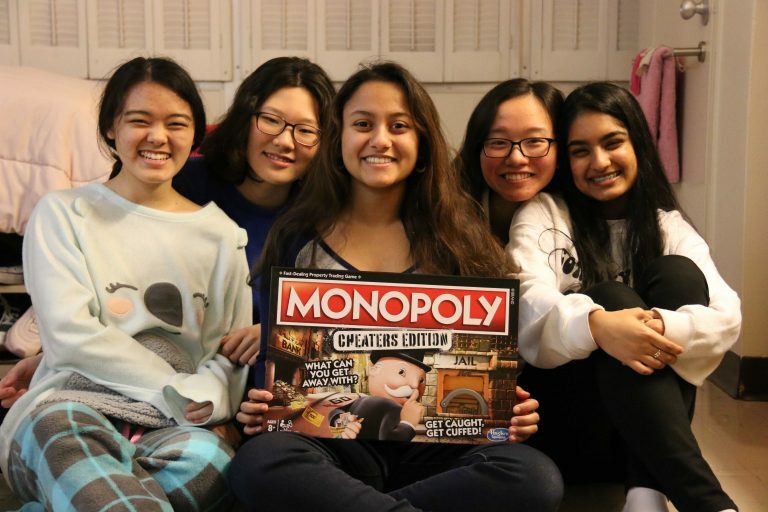 In addition to the standard shelving and cataloging books, Drogin is also tasked with keeping tracks of the boarders in the library and ensuring that they have fulfilled their required two hours of study hall per week. She does so through a system called Boardingware. Out of all of the books in the library, Drogin has a few favorites. First, “Hillbilly Elegy: A Memoir of a Family and Culture in Crisis.” However, she has also recently taken up a different genre: children’s literature. Ultimately, as both Lott and Lake expressed, Drogin’s time at Hockaday has been made all the more enjoyable by the people that surround her every day.